A struggle is under way for the “soul” of America’s nonprofit sector, that vast collection of private, tax-exempt hospitals, higher-education institutions, day care centers, nursing homes, symphonies, social service agencies, environmental organizations, civil rights organizations, and dozens of others that make up this important, but poorly understood, component of American life. This is not a wholly new struggle, to be sure. From earliest times nonprofits have been what sociologists refer to as “dual identity,” or even “conflicting multiple identity,” organizations.1 They are not-for-profit organizations required to operate in a profit-oriented market economy. They draw heavily on voluntary contributions of time and money, yet are expected to meet professional standards of performance and efficiency. They are part of the private sector, yet serve important public purposes. In recent years, however, these identities have grown increasingly varied and increasingly difficult to bridge, both in the public’s mind and in the day-to-day operations of individual organizations. In a sense, America’s nonprofit organizations seem caught in a force field, buffeted by a variety of impulses, four of which seem especially significant. For the sake of simplicity I label these voluntarism, professionalism, civic activism, and commercialism, though in practice each is a more complex bundle of pressures. What makes these four impulses especially important is that their relative influence can profoundly affect the role that nonprofit organizations play and the way in which they operate. Understanding this force field and the factors shaping its dynamics thus becomes central to understanding the future both of particular organizations and of the nonprofit sector as a whole. Sadly, far too little attention has been paid to the significant tensions among these impulses. The nonprofit sector has long been the hidden subcontinent on the social landscape of American life, regularly revered but rarely seriously scrutinized or understood. In part, this lack of scrutiny is due to the ideological prism through which these organizations are too often viewed. Indeed, a lively ideological contest has long raged over the extent to which we can rely on nonprofit institutions to handle critical public needs, with conservatives focusing laser-like attention on the sector’s strengths in order to fend off calls for greater reliance on government, and liberals often restricting their attention to its limitations in order to justify calls for expanded governmental protections. Through it all, though largely unheralded—and perhaps unrecognized by either side—a classically American compromise has taken shape. This compromise was forged early in the nation’s history, but it was broadened and solidified in the 1960s. Under it, nonprofit organizations in an ever-widening range of fields were made the beneficiaries of government support to provide a growing array of services—from health care to scientific research—that Americans wanted but were reluctant to have government provide directly.2 More, perhaps, than any other single factor, this government-nonprofit partnership is responsible for the growth of the nonprofit sector as we know it today. Since about 1980, however, that compromise has come under considerable assault. Conservative critics, concerned about what they see as an unholy alliance between the once-independent nonprofit sector and the state, have called for a return to the sector’s supposed purely voluntary roots.3 Liberal critics have bewailed the sector’s departure from a more socially activist past and its surrender to professionalism.4 At the same time, the country’s nonprofit managers, facing an extraordinary range of other challenges as well—significant demographic shifts, fundamental changes in public policy and public attitudes, new accountability demands, massive technological developments, and changes in lifestyle, to cite just a few—have been left to their own devices and have turned increasingly to the market to survive. Through it all, nonprofit America has responded with considerable creativity to its many challenges, but the responses have pulled it in directions that are, at best, not well understood and, at worst, corrosive of the sector’s special character and role. 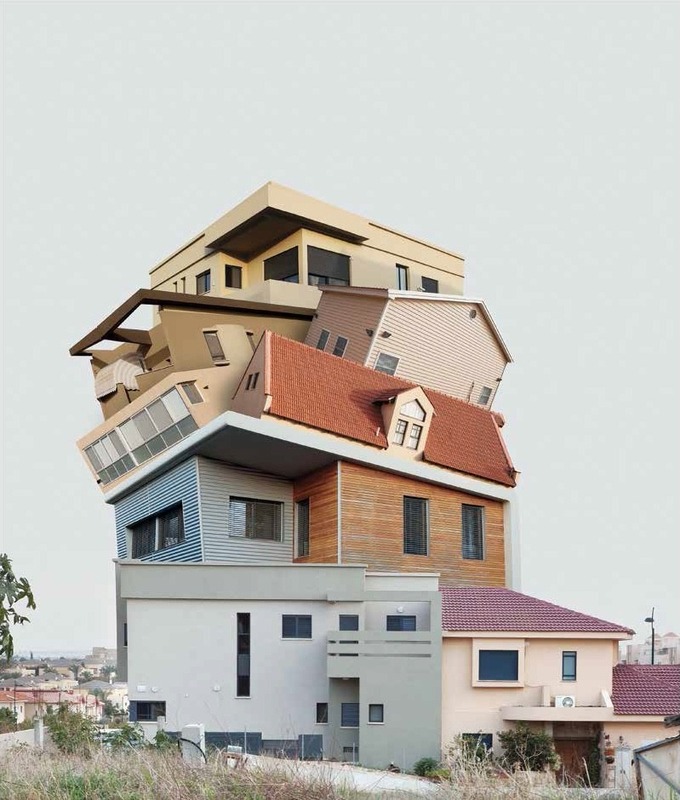 Perhaps the central theme that emerged from this larger project, and that is a central theme [here], is the theme of resilience, of a set of institutions and traditions facing not only enormous challenges but also important opportunities and finding ways to respond to both with considerable creativity and resolve. Indeed, nonprofit America appears to be well along in a fundamental process of reengineering that calls to mind the similar transformation that large segments of America’s business sector have been undergoing since the late 1980s.7 Faced with an increasingly competitive environment, nonprofit organizations have been called on to make fundamental changes in the way they operate. And that is just what they have been doing. The problem, however, is that, although the sector’s organizations have been responding resiliently, those responses are taking a toll on their ability to perform some of their most important functions. As a consequence, nonprofit America is ironically endangered by its own resilience. In a sense, nonprofits have been forced to choose between two competing imperatives: a survival imperative and a distinctiveness imperative, between the things they need to do to survive in an increasingly demanding market environment and the things they need to do to retain their distinctiveness and basic character.8 In recent years, the survival imperative seems to have gained the upper hand. The question for the future is whether it will continue to do so, or whether the nation’s nonprofit sector will find better ways to balance these demands, and how much understanding and help they will receive from the broader society to allow them to do so. Any account of the future of nonprofit America must therefore be a story in three parts, focusing, first, on the challenges and opportunities that America’s nonprofit sector is confronting, then examining how the sector’s institutions are responding to these challenges and opportunities, and finally assessing the consequences of these responses both for individual organizations and subsectors and for nonprofit America as a whole. Against this backdrop, it will then be possible to identify some of the steps that might be needed to help America’s nonprofit organizations evade the dangers they face. […] To set the stage for [such an account], however, it may be useful to remind readers what the nonprofit sector is and why it is so deserving of our attention. While the key nonprofit functions of delivering services, influencing policy, giving expression to multiple interests and views, building community, and guarding crucial values […] continue to characterize the nonprofit sector, powerful forces are at work challenging and reshaping a number of them. Indeed, as noted earlier, the nonprofit sector appears caught in a difficult force field controlled by four conflicting impulses—voluntarism, professionalism, civic activism, and commercialism—that are pulling it in somewhat different directions. These impulses have implications, moreover, for a broad swath of nonprofit features, from the roles that nonprofits play and the strategies they use to their style of operation, their principal reference groups, their organizational structure, their management style, and their resource base. The power of these impulses is hardly identical in all fields, or in all organizations even within fields, but there is enough commonality to the impulses to warrant a general characterization of their major features as a prelude to examining the drivers that are supporting or retarding each. Whether in its more ideological or its more balanced forms, this voluntaristic impulse continues to exert a strong gravitational pull on public perceptions of the nonprofit sector, if less so on the actual operations of the sector’s organizations. 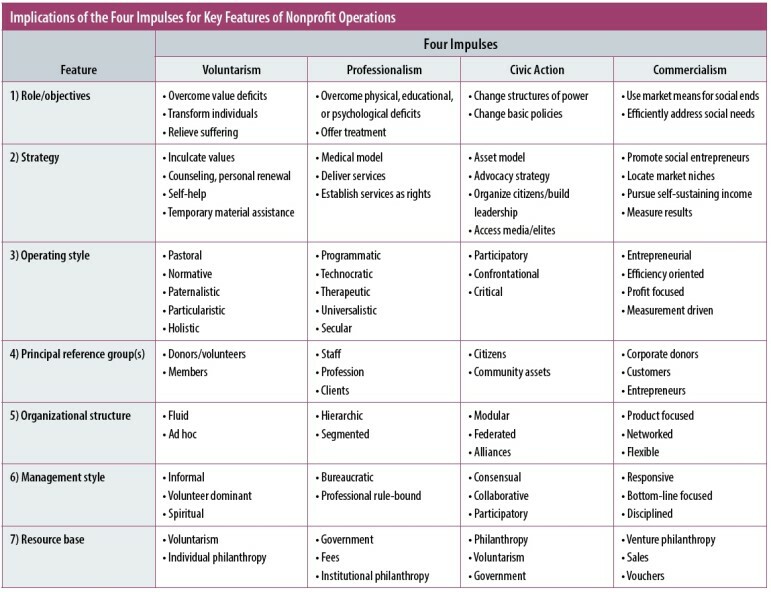 More specifically, as summarized in the table below, the voluntaristic impulse has come to be associated with a nonprofit sector whose primary role is to express and inculcate values. While a wide assortment of values can find resonance with this impulse, in recent years an especially strong current has arisen from the religious right and has found expression in the faith-based charity movement. Adherents to this perspective tend to attribute a wide range of human problems to the absence or underdevelopment of appropriate normative values. The strategies of intervention associated with this impulse therefore often emphasize counseling and self-help, coupled with temporary material assistance until the needed value messages are internalized and absorbed. Professionalism’s strategy thus relies on a medical model, treating beneficiaries essentially as “patients” needing some form of “treatment,” whether physical, educational, or psychological. Unlike the pastoral and holistic operating style characteristic of the voluntaristic impulse, the professional style is thus therapeutic, technocratic, segmented, and secular. The principal reference group for the professional impulse is not donors or beneficiaries but professional staff and the profession itself. Consistent with these features, professionalism creates organizational structures that are hierarchic and segmented; uses a management style that tends toward the bureaucratic, formal, and rule-bound; and requires the more ample and reliable resources of government and fees for support. Instead of expressing values and transforming individuals, the civic activism impulse thus sees the fundamental role of the nonprofit sector to be eliminating the need for services by changing the balance of power in society and opening channels of opportunity to a broader swath of the population. Unlike the deficit strategies embodied in both the voluntaristic and professional impulses, the civic activism impulse embodies an asset model, using a strategy that sees in the disadvantaged population an enormous resource that can be mobilized and organized to bring about significant societal change. The basic operating style favored in this impulse is thus at once participatory, empowering, and confrontational, bringing pressure to bear on the powers that be to establish worker rights and offer access to education and other services that those on the bottom of the economic pyramid are unable to secure through market means. The principal reference groups for advocates of this perspective are ordinary citizens and those in greatest need, plus, where available, the media, to amplify the voices of otherwise voiceless constituencies. To achieve its empowerment objectives, the civic activism impulse fosters a modular organizational structure, with multiple linked nodes of action and mobilization. Its management style is consensual, participatory, and, where possible, collaborative, building alliances wherever willing partners can be located. And its resource base tends to be engaged individuals and, paradoxically in recent decades, government support. Finally, in the past several decades, a fourth impulse has burst upon the nonprofit scene, commercialism, and its next-of-kin, managerialism.22 This impulse, too, has its distinctive features and its distinctive implications for the operation of nonprofit organizations, some of which are consistent with the other impulses, but others of which are clearly in tension with them. The role that the commercial impulse presses on the nonprofit sector is a service role, but one that emphasizes managerial efficiency, innovation, and cost containment—dimensions that run counter to professionalism’s emphasis, first and foremost, on effectiveness. The strategy embodied in the commercial impulse is the injection of a different type of professionalism into the operation of nonprofit organizations—not the subject-matter professionalism of doctors, social workers, and educators but the business-oriented skills of the managerial professional. This includes the use of strategic planning, quantitative measurement of outcomes, identification of market niches, and heightened attention to operational efficiency. The operating style emphasized by the commercial/managerial impulse is entrepreneurial and businesslike, efficiency oriented and measurement driven. The principal reference group for those espousing the commercial impulse consists of business leaders, entrepreneurs, and actual or potential beneficiaries of an agency’s services, who are reconceptualized as “customers.” The commercial/managerial impulse calls for organizational structures that are focused on individual “products” or “lines of business,” with metrics that track each line of business separately and network structures that encourage coordination but allow considerable autonomy for “product managers.” The management style consistent with this impulse emphasizes clear lines of authority and disciplined performance, which is achieved through regular measurement against preset targets and the flexibility to advance and dismiss staff on the basis of performance rather than professional credentials. In terms of its resource base, the commercial impulse drives its adherents to search out sustainable revenue streams that can attract private investment capital for start-up and expansion. This means fee income and government entitlement program support, particularly such support delivered through vouchers and other market-based, consumer-side subsidies. To be sure, these brief descriptions cannot do justice to the nuances and complexities of these various impulses. They are presented here as heuristic devices to suggest some of the major pressures to which nonprofit organizations are being subjected. What is more, while the impulses are in some tension with each other, there are also clearly points of mutual reinforcement. For example, professionalization and the growth of nonprofit paid staff may not have displaced the nonprofit involvement in advocacy, though they may have changed its character in certain ways. Similarly, the emergence of social entrepreneurs and social ventures, while a manifestation of the commercial impulse, also reinforces the voluntaristic impulse emphasizing private initiative in the common good. The challenge, therefore, is not to find the single best impulse to follow but rather the combination that produces the most meaningful and appropriate balance needed to allow organizations to survive and grow while still holding true to their distinctive attributes. These impulses are not, moreover, disembodied concepts floating in space. Rather, they take concrete form in the actions of the sector’s stakeholders—those who provide the resources, set the regulations and incentives, serve on the boards, operate the organizations, frame public perceptions, and lend their support in countless other ways. Lacking the firm anchor of a single clear, dominant raison d’être—such as maximizing profit in the case of business and securing popular political support in the case of government—nonprofits are especially vulnerable to being pulled this way and that by whichever pressure is dominant at the moment. And this is just what appears to be happening at the present time. Responding brilliantly and resiliently to a variety of dominant challenges and pressures, significant components of the nonprofit sector have moved far from the sweet spot that has historically earned the sector public trust, and too little attention has been given to bringing public understanding in line with operating realities or to finding a more appropriate balance among the impulses that are pressuring the sector and its leaders. In a sense, to survive in a demanding environment, nonprofit organizations are being forced to surrender what may be too many of the things that make them distinctive and worthy of the special advantages they enjoy. Of special note in recent years has been the growing impact of the commercial/managerial impulse, eclipsing the professional emphasis on effectiveness and the voluntaristic emphasis on expressiveness, and potentially undermining as well much of the sector’s historic attention to civic activism. Nonprofit leaders are not without choices in this process, of course. But their choices are highly constrained by the balance of challenges and opportunities they face. 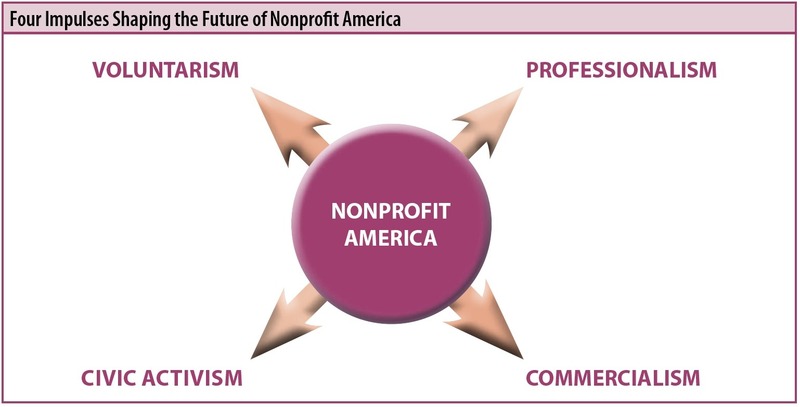 Any account of the “future of nonprofit America” in the face of these impulses must therefore be a story in three parts, focusing first on these challenges and opportunities and the extent to which they support or retard these impulses, then examining how the sector’s leaders have responded, and finally assessing the consequences of these responses both for individual organizations and subsectors and for nonprofit America as a whole. Only then will it be possible to suggest what alternative options might be worth considering in order to achieve a more appropriate balance among the impulses at play than seems to be emerging. David A. Whetten and Paul C. Godfrey, Identity in Organizations: Building Theory Through Conversations (Thousand Oaks, CA: Sage Publications, 1998); Mary Ann Glynn, “When Cymbals Become Symbols: Conflict over Organizational Identity within a Symphony Orchestra,” Organization Science 11, no. 3 (2000): 285–98. For a discussion of this partnership, see Lester M. Salamon, “Partners in Public Service: The Scope and Theory of Government-Nonprofit Relations,” in The Nonprofit Sector: A Research Handbook, ed. Walter W. Powell (New Haven: Yale University Press, 1987), 99–117; and Lester M. Salamon, Partners in Public Service: Government-Nonprofit Relations in the Modern Welfare State (Baltimore: Johns Hopkins University Press, 1995). Michael S. Joyce and William A. Schambra, “A New Civic Life,” in To Empower People: From State to Civil Society, ed. Michael Novak, 2nd ed. (Washington, DC: AEI Press, 1996), 11–29; Robert A. Nisbet, Community and Power, 2nd ed. (New York: Oxford University Press, 1962). Carmen Sirianni and Lewis Friedland, Civic Innovation in America: Community Empowerment, Public Policy, and the Movement for Civic Renewal (Oakland, CA: University of California Press, 2001); Harry C. Boyte, Commonwealth: A Return to Citizen Politics (New York: Free Press, 1989); John McKnight, The Careless Society: Community and Its Counterfeits (New York: Basic Books, 1995). Alexis de Tocqueville, Democracy in America, vol. 2, trans. Henry Reeve, rev. Francis Bowen, ed. Phillips Bradley (1835; revised ed., New York: Vintage Books, 1945), 118. For the full results of this larger project, see The State of Nonprofit America, ed. Lester M. Salamon, 2nd ed. (Washington, DC: Brookings Institution Press, 2012). The present book from which this article is adapted originally appeared in somewhat abridged form as Chapter 1 of this broader volume, though it has been updated here. On the reengineering movement in the corporate sector, see Michael Hammer and James Champy, Reengineering the Corporation: A Manifesto for Business Revolution (London: Nicholas Brealey Publishing, 1993); David K. Carr and Henry J. Johansson, Best Practices in Reengineering: What Works and What Doesn’t in the Reengineering Process (New York: McGraw-Hill, 1995). I am indebted to Bradford Gray and Mark Schlesinger for introducing this concept. See Bradford H. Gray and Mark Schlesinger, “Health Care,” in The State of Nonprofit America, 123–25. Waldemar A. Nielsen, The Endangered Sector (New York: Columbia University Press, 1979), 24–25. See, for example, Nisbet, Community and Power; Peter L. Berger and Richard John Neuhaus, To Empower People: The Role of Mediating Structures in Public Policy (Washington, DC: AEI Press, 1977); Joyce and Schambra, “A New Civic Life”; Leslie Lenkowsky, “Philanthropy and the Welfare State,” in To Empower People, 2nd ed., 90–91. This portrait of the characteristics of the voluntaristic impulse draws on a variety of sources, including Stuart Langton, “The New Voluntarism,” Nonprofit and Voluntary Sector Quarterly 10, no. 1 (January 1981): 7–20; Barry D. Karl, “Volunteers and Professionals: Many Histories, Many Meanings,” in Private Action and the Public Good, ed. Walter W. Powell and Elizabeth S. Clemens (New Haven: Yale University Press, 1998), 245–57; Peter Frumkin, On Being Nonprofit: A Conceptual and Policy Primer (Cambridge, MA: Harvard University Press, 2002); Joyce and Schambra, “A New Civic Life”; Karin Kreutzer and Urs Jäger, “Volunteering versus Managerialism: Conflict over Organizational Identity in Voluntary Associations,” Nonprofit and Voluntary Sector Quarterly 40, no. 4 (2011): 634–61; Robert L. Woodson Sr., “Success Stories,” in To Empower People, ed. Novak, 105–15. See, for example, Judith Ann Trolander, Professionalism and Social Change: From the Settlement House Movement to Neighborhood Centers, 1886 to the Present (New York: Columbia University Press, 1987), 39, 238–39; Roy Lubove, The Professional Altruist: The Emergence of Social Work as a Career, 1880–1930 (Cambridge, MA: Harvard University Press, 1965), 49–53; David Rosner, A Once Charitable Enterprise: Hospitals and Health Care in Brooklyn and New York, 1885–1915 (New York: Cambridge University Press, 1982), 6–12. According to Harold Wilensky, there are at least five steps crucial to the establishment of a profession: full-time work, a curriculum and training schools, a professional association, official licensing or certification requirements, and a formal code of ethics. Wilensky, “The Professionalization of Everyone?,” 142–46. Rosner, A Once Charitable Enterprise, 6. Lubove, The Professional Altruist, 48. Trolander, Professionalism and Social Change, 40; Karl, “Volunteers and Professionals,” 256. Lubove, The Professional Altruist, 23. The portrayal of the civic activism impulse here draws on Vernon E. Jordan Jr., “Voluntarism in America,” Vital Speeches 43, no. 16 (1977), 493; Langton, “New Voluntarism,” 10–11; Theda Skocpol, Diminished Democracy: From Membership to Management in American Civic Life (Norman, OK: University of Oklahoma Press, 2003); Frumkin, On Being Nonprofit, 29–31, 53–61; Sirianni and Friedland, Civic Innovation in America; Boyte, Commonwealth. Trolander, Professionalism and Social Change, 1. Brian O’Connell, “From Service to Advocacy to Empowerment,” Social Casework 59, no. 4 (April 1978): 198. The description of the characteristics of the commercial impulse here draws on the following sources, among others: Hwang and Powell, “The Rationalization of Charity”; Kreutzer and Jäger, “Volunteering versus Managerialism”; Frumkin, On Being Nonprofit, 129–62; Lester M. Salamon, “The Marketization of Welfare: Changing Nonprofit and For-Profit Roles in the American Welfare State,” Social Service Review 67, no. 1 (1993): 17–39; Angela M. Eikenberry and Jodie Drapal Kluver, “The Marketization of the Nonprofit Sector: Civil Society at Risk?,” Public Administration Review 64, no. 2 (2004): 132–40; Howard P. Tuckman, “Competition, Commercialization, and the Evolution of Nonprofit Organizational Structures,” in To Profit or Not to Profit: The Commercial Transformation of the Nonprofit Sector, ed. Burton A. Weisbrod (New York: Cambridge University Press, 1998), 25–46; Burton A. Weisbrod, “Modeling the Nonprofit Organization as a Multiproduct Firm: A Framework for Choice,” in To Profit or Not to Profit, 47–64; Kevin P. Kearns, Private Sector Strategies for Social Sector Success: The Guide to Strategy and Planning for Public and Nonprofit Organizations (San Francisco: Jossey-Bass, 2000). Lester M. Salamon is a professor at Johns Hopkins University—where he is director of the Center for Civil Society Studies in the School of Public Health—and was founding director of the Institute for Policy Studies. His publications include Partners in Public Service: Government-Nonprofit Relations in the Modern Welfare State (Johns Hopkins University Press, 1995), Rethinking Corporate Social Engagement: Lessons from Latin America (Kumarian Press, 2010), and, most recently, The Resilient Sector Revisited: The New Challenge to Nonprofit America, 2nd ed. (Brookings Institution Press, 2015). The Marshall Project’s Bill Keller discusses the importance of “niche” and how this idea has played out vis-à-vis the new trend of online news sites.